I like Christmas confectionery, pastry, chocolate, pepper nuts, Christmas lunches and Christmas food. However, I think that sometime in my mind tends to go above and beyond what I usually eat for the rest of the year. In order to not only get into chocolate and homemade vanilla pastry which is quite nice to make and taste delicious. I also make sure to eat sushi. So after all, I get some low fat food that offsets some of the fatness. Especially November and December I make sushi more than the rest of the year. 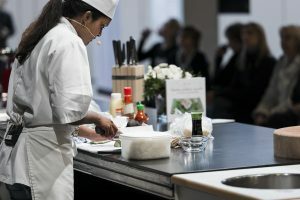 On the upcoming Sushi course for beginners attendants learn to make the most sought after sushi rolls with a selection of the most popular ingredients. As we are so close to New Year we also talk which fish is best suited for sushi at that time.